Amid global discussions regarding the Great Council of the Orthodox Church in 2016, Saint Vladimir’s Seminary Press recently announced two soon-to-be-released publications that explore issues related to primacy and conciliarity. Both volumes are compilations that feature the work of expert scholars. 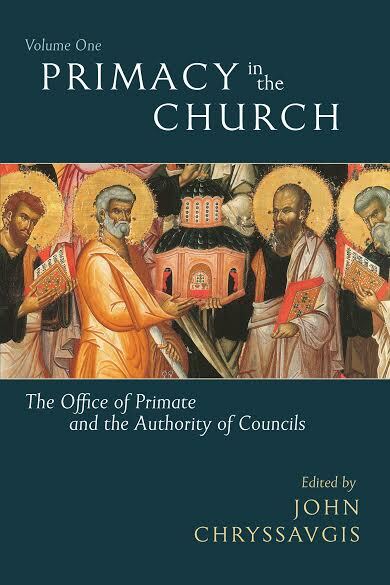 Primacy in the Church: The Office of Primate and the Authority of Councils (Volume I) was edited by the Reverend Dr. John Chryssavigis, Archdeacon of the Ecumenical Patriarchate, while the newest issue of St. Vladimir’s Theological Quarterly (Vol. 60, No. 1–2) was edited by Dr. Paul Meyendorff, the Father Alexander Schmemann Professor of Liturgical Theology at Saint Vladimir’s Seminary. In the first volume of Primacy in the Church, Father Chryssavigis examines the development and application of a theology of primacy and synodality through the centuries, and addresses what is arguably the most significant and sensitive issue in both inter-Orthodox debate and inter-Christian dialogue—namely, the authority of the primate and the role of councils in the thought and tradition of the Church. The editor draws together original contributions from prominent scholars today, complemented by formative selections from theologians in the recent past, as well as relevant ecumenical documents. The second volume, to be released this spring, will explore how such a theology can inform contemporary ecclesiology and reconcile current practices. “The editor and contributor of four articles, Father John Chryssavgis, is to be commended and congratulated because he managed—in cooperation with Saint Vladimir’s Seminary Press—to place at the disposal of Church authorities and theologians a valuable resource on a crucial issue,” said His Eminence, Archbishop Demetrios of the Greek Orthodox Archdiocese of America. SVS Press is offering a pre-publication discount on Primacy in the Church (Volume I) through January 31, 2016. It may be purchased here. The special double issue of Saint Vladimir’s Theological Quarterly may be purchased here. Since its inception in 1968, SVS Press has been integral to the seminary’s mission to serve Christ and His Church through theological education, research and scholarship. Its books, music and lecture CDs, and children’s titles provide spiritual and intellectual nourishment to Orthodox Christian faithful and those around the globe seeking information about the Orthodox Church.